Patton’s new G.703/G.704 toolless insulating displacement connecting (IDC) module baluns are ideal for carriers seeking a cost-effective, space-efficient, and proven method of impedance matching 75-Ohm coax to 120-Ohm single-conductor connections. The baluns provide transparent bi-directional signal conversion with no AC or battery power required. Various industry standard types of coaxial connectors (75 Ohm) are available including male and female combinations of BNC, 1.6/5.6, 1.0/2.3, and Type 43. The 3-pole toolless IDC connector used for wrapping single-conductor connections (120 Ohm) utilizes a slit in the cable anchor to allow the cable to be inserted after termination. The toolless IDC connector is also offset so that a cable can be positioned between baluns on the DDF/patch panel as required. The toolless IDC connector is clearly labeled A, B, and G (Ground) to make installation more convenient. Patton’s Ultra-miniature G.703 toolless IDC baluns are fully shielded and are ideal in telecom applications where space is a premium. The Model 430 Series can be panel mounted or cable mounted and feature IDC terminations which allow installation without the need of special tools. 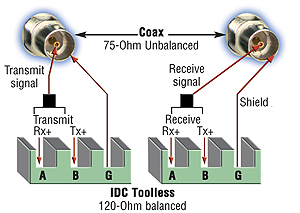 Converting your G.703 signal from coax to twisted-pair enables the use of high density IDC modules in the Digital Distribution Frames (DDF), which significantly increases the available density. Specially designed toolless IDC connector for easy connection of unterminated cable. 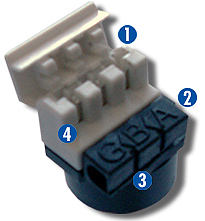 IDC toolless connector clearly marked A, B and G for easier installation. Slit in cable anchor allows cable to be inserted after termination. 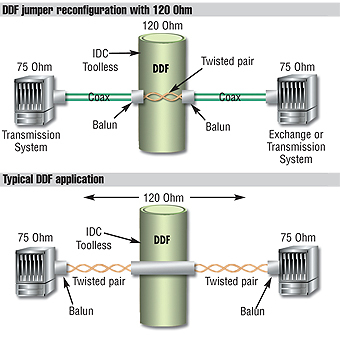 Offset IDC allows cable to be positioned between baluns on DDF as required.